摘要 采用能量法对几例常规变压器和特殊结构的模型变压器、铁心电抗器短路阻抗的电抗分量进行了计算,实际的计算结果与实际测量结果对比表明,能量法有较好的精度. 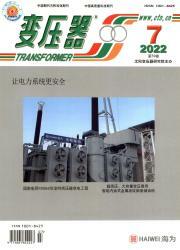 The reactance components of short circuit impedance in common and special model transformers and core reactors are calculated by the energy method. The comparison of calculating results with measuring results show the energy method has good precision. 5赵志衡 ,李春峰 ,李建辉 ,邓将华 .管坯电磁胀形磁场特性及磁压力分布[J].机械工程学报,2005,41(4):185-188.